When I think of Texas I think about tacos. I’ve made countless trips to the Lonestar Sate So it seems fitting that this week I’d post a recipe for tacos. And these Juicy and Tender Slow Cooker Pulled Pork Tacos are, I think, just what the doctor ordered. Definitely “comfort food”. Wrapped in the freshest corn tortillas you can find (toasted or not, your choice!) 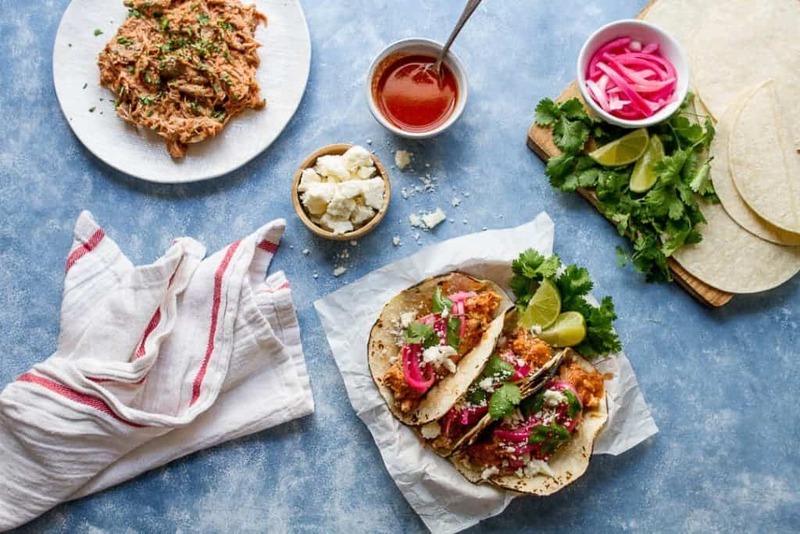 and topped with marinated red onions, cotija cheese and a sprig of cilantro, these are the tacos I want when I want comfort food in the summer – and to be honest, just about any time of year. I’ve been making large batches of this pulled pork and have several containers stashed in my freezer for the coming weeks when I know the schedule is going to get a bit dicey and these tacos will go a long way towards soothing jangled nerves. Much and all as I’d like to claim credit for creating this “recipe” – it predates me by several hundred years! 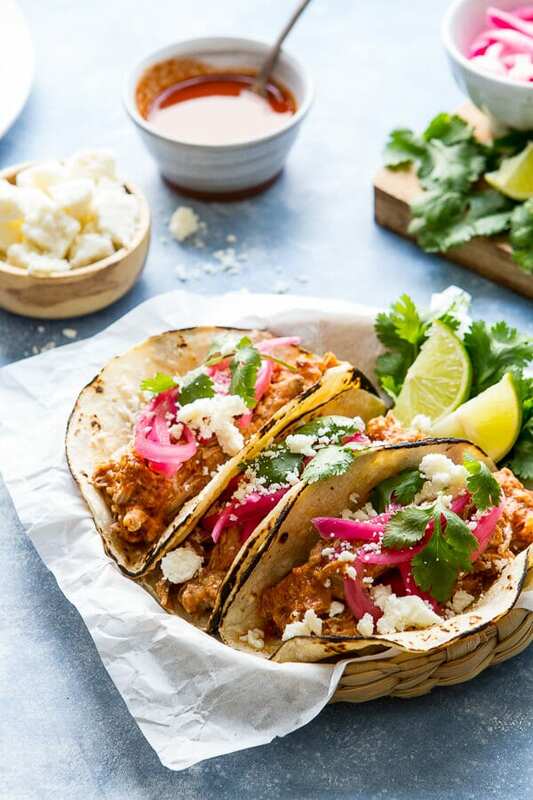 These Juicy and Tender Slow Cooked Pulled Pork Tacos are a version of Cochinata Pibil. This famous Yucatan dish consists of pork that’s marinated in sour orange juice, seasoned with ground annatto seeds and then wrapped in banana leaves and slow roasted in a pit. The true history of the dish however, is lost in time and probably pre dates written history. The use of sour orange juice however, is a more recent development – the oranges arrived with the Spanish sometime in the 1500’s. This slow cooker version comes darn close. And topped with marinated onions, sprinkled with cotija and cilantro and wrapped in a fresh and warm tortilla? 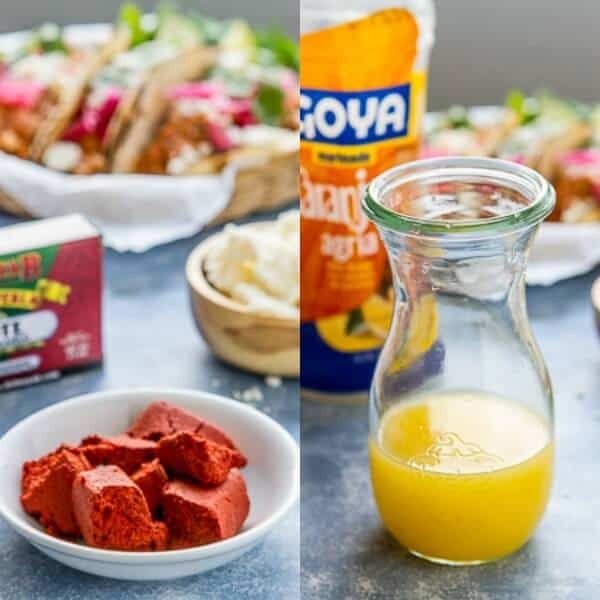 Divine, I tell ya, divine – and worth a trip to your local Hispanic market for achiote paste, bitter orange juice… not to mention finding the freshest corn tortillas! Check out my Juicy and Tender Pulled Pork Video to see just how easy these tacos are to make! So, make yourself a batch of this pulled pork and share these tacos with those you love…. Looking for some other Latin recipes? You might enjoy..
Cut the pork into 2 inch thick slices. In a bowl combine the achiote paste, bitter orange juice, oregano, cumin, garlic, salt and pepper. Whisk until the achiote paste is fully dissolved. Place the pork into a large ziploc bag and pour the marinade over. Refrigerate for a minimum of 4 hours or overnight. Put the pork and marinade in a slow cooker. Cook on high for 4 1/2 - 5 hours or until the pork is fork tender. Remove the pork from the slow cooker and let cool for 15 minutes. Pour the remaining marinade from the slow cooker over the pork and stir to combine. If not using immediately, cover and either refrigerate or freeze. 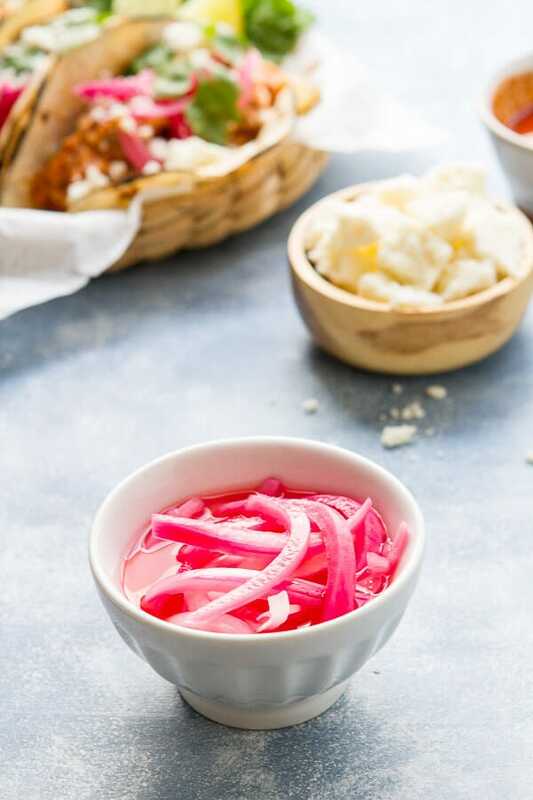 While the pork is cooking, combine the onions with the Naranja Agria and salt in a small bowl. Cover and store in the refrigerator for up to 4 days. You can use the tortillas as they are, or you can char them over a gas cooktop or on the grill. Fill with 1/4 cup of the pulled pork, top with some of the marinated red onions,cotija cheese and cilantro. Although the prep time seems long, the majority of that time is for marinating! Love the propping and styling on these images. So pretty, Nancy! I would be comforted by those delicious looking tacos! YUM. Beautiful photo Nancy! Always inspiring! Perfect for Taco Tuesday! We love tacos at my house! Thank you so much for stopping by Melissa! 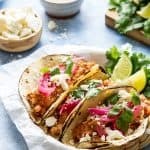 These tacos are truly wonderful – had to make a second batch to photograph because the family devoured the first batch before I could shoot it! !